Come explore Numenhalla, the god halls. Learn about the altars and the logos, see the ettercop lair. 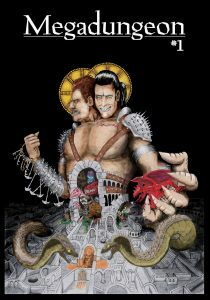 This is a 43 page periodical focused on megadungeons, with two two-page dungeon areas presented. Imagine is a megadungeon was broken up in to parts and serialized through a number of magazine issues. That’s what this is. You get a few sections/articles about how to run a megadungeon, a few more with some background/weird in THIS megadungeon, and then a couple of parts of the megadungeon proper. It’s less academic and more oriented towards play. I’m being generous here, because I only review adventures. If I think of this as, say, Dwimmermount, broken up in to different issues, ala The Darkness Beneath, then I’m still reviewing an adventure. Plus, I like megadungeons and I’m a hypocrite. Courtney has a conceit that the idea is based around: megadungeon are infinite. With this in mind the periodical thing makes more sense. He’s not publishing a dungeon but rather parts of the dungeon … and that could go on forever. This has the effect of the dungeon parts looking a little like they do in the 13th Age Eyes of the Stone Thief; little self-contained modules that stand in for the levels in a traditional megadungeon. It’s up to the DM to tie them together. And that’s a theme. The advice sections are just advice, needing a DM to tie them together. We’re told, for example, that a plunge in to the megadungeon is to accomplish a task, get something or so on. But for the SPECIFIC megadungeon presented there’s none of that present. A table and/or article for a future issue, perhaps? These advice sections range from explaining how megadungeon play different, and what’s important about it, to how to run a megadungeon campaign in 5e. The advice here is pretty standard megadungeon advice, or, maybe I mean “new megadungeon advice.” It covers concepts like exploration and treasure extraction, resource constraints as a part of play, the weirdness and ambiguity in megadungeons and so on. Folks who have kept up with the OSR should recognize the ideas. Being oriented toward play, their are less academic article presentations and more brief summaries of the issues. There’s a place for both and I’d hope to an inclusion of the more academic type in the future. There’s a small amount of specific information presented for this dungeon. A mythology article, one on the gods, one on their “altars” (which are a lot like ASE1.) This is good stuff, but it’s all essentially fluff. Actually, it’s a little better than fluff. The god descriptions are just the generic god stuff, but then hey have a little poem/myth snippet that is pretty good for reference during play, enhancing the mystery and ambiguity of a megadungeon. There’s a bit of extra campaign content, like a new class (machine men, you have to go to town to get spare parts to heal!) and so on. There are two megadungeon sections/levels provided. The first is an entrance hall area and the second an ettercop tree level. They share the same basic layout even with the entrance being a kind of traditional “top down” view and the ettercop level being arranged vertically around a tree. Both have around eight encounter areas. Both have the same basic layout of a map page, resembling an artistic rendering rather than a 10’ hex layout, and then a page of text using an uncommon description style. FInally, there’s a page of free text that may contain tables, etc. Let’s call it “the appendix data for the level on the previous page.” Column one has a room name and a short evocative description under it in italics. Column two has facts related to the rooms in column one, short punchy statements of mechanics, etc. It’s not exactly space efficient, but it does make it easy to find information. The art/map is integral to the description. In the second dungeon room two says “the tree is 15’ away” … which is the only mention of a tree in the room description, either part. But the map/art clearly shows you are on a ledge with a big tree a short distance away. This sort of interplay between the map and description is a good thing, overloading the data on the map to provide more context. But … there’s some hand waving. In the context of the periodical, and advice, it makes sense. “Use wandering monsters that make sense.” In the context of helping a DM at the table … well, not so well. The wandering monster table would be better fixed to the DM screen or appearing on the maps. (Hmmm, a new magazine feature? “Print this and attach it to your screen.”) Plus, a little table of actual wanderers for the level would be trivial to include, enhancing usability. The content is spot on. A black doorway that kills all who touch it … you have to be dead to pass through. A spider queen you can talk to. People being sacrificed to said spiders who are happy to talk about their willing religion/sacrifice. And some silly stuff, like anthropomorphic ants that pretend to be spiders with community theater costumes. This is a serviceable product. I think I would have prefered a more academic approach to the advice and still more actual dungeon content. The ettercop dungeon, in particular, is a memorable level while the entry hall is full of mystery and implied danger … exactly what an entry should be. An ettercop dungeon level based around a giant tree sounds spot on for part of a dungeon I’m designing, and I’d like to steal and rework it. Would you say that level is worth the $6 on its own? It’s small, but, it’s only $6. What is that, one beer at a bar? And some silly stuff, like anthropomorphic ants that pretend to be spiders with community theater costumes. Thank you for the endless, useful reviews. This particular one makes your usefulness for QA before publishing very apparent. It’s that something you would generally be interested in helping with? Don’t get arrested by the Po Po! Look out, it’s an Ettercop. No Gods. No Masters. I reject the tyranny of Samuel Johnson.